I was able to attend a very interesting and timely DoDLive Bloggers Roundtable today with U.S. Coast Guard Rear Admiral Mary Landry, Federal On-Scene Coordinator for Unified Area Command, Deepwater Horizon Response. 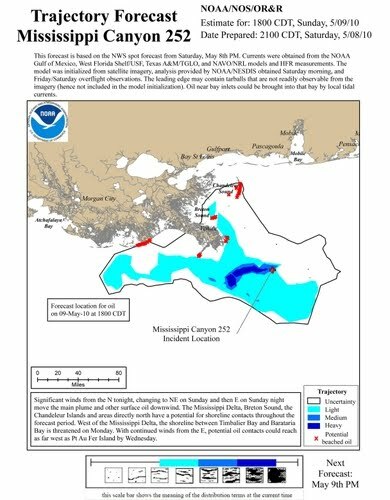 Admiral Landry gave a quick update on the organization of our national response and the current status of this tragic oil spill in the Gulf of Mexico! The admiral described the national response as “quite remarkable” which is to “secure the well, fight the spill offshore, protect the coast and minimize impacts on the environment and local economy”. The oil rig Deepwater Horizon owned by British Petroleum exploded April 20, killing 11 people and sinking two days later. The over than 20,000 responders fighting the battle are from the Coast Guard, Department of Defense, National Guard personnel under State status, Department of Interior, Department of Labor and many others. The admiral is responsible for coordinating their efforts to bring the most bang for the buck and to avoid duplication during the cleanup. As of this evening the admiral said that $500,000,000 had been spent to do clean up which she described as a “good clean up” and that the weather has been very cooperative. She described the critical factor as closing off the well so the clean up can mitigate the impact of the spill. According to her, the effectiveness of the off shore clean up has reduced the need for on shore clean up. They are using Air Force and Coast Guard resources to control air and maritime resources in the Gulf of Mexico near the incident. She specifically commented that the Air Force resources at Tyndall AFB had responded with the means to provide a safety net around flights in the gulf with lessons learned from the earthquake in Haiti! The Coast Guard is managing maritime conflicts with their Maritime Transportation Systems Recovery to support the businesses operating in the gulf. This includes oil removal from the hulls of ships returning to port. She said there 35,000 workers off shore daily and they were attempting to not disrupt their work and businesses. Admiral Landry closed with comments on how hard the responders were working to be a buffer for the gulf coast communities who have seen a lot of disasters in the near past. They are attempting to reduce the impact and she felt that some “national good” was coming from this effort. I was impressed with her statement on transparency and integrity. She wants to ensure transparency in their reporting to the American people and that she “values her integrity” concerning how the response is reported. Clearly, a well trained officer she responded well and openly to questions which showed she walked the walk and talked the talk! Thank you Admiral Landry and for the efforts of the men and women in your command and coordination effort! To read more on the military response please go to MilitaryAvenue Articles! If you would like to listen to this lively and interesting discussion please go to DoDLive! ROBERT, La. 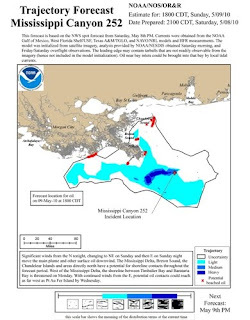 - Unified Area Command releases an image showing predicted oil trajectory for May 9, 2010. Graphic prepared by NOAA.